Makes sure everything works right. Wing flaps open. Wing flaps close. Lights shine bright on tail and nose. 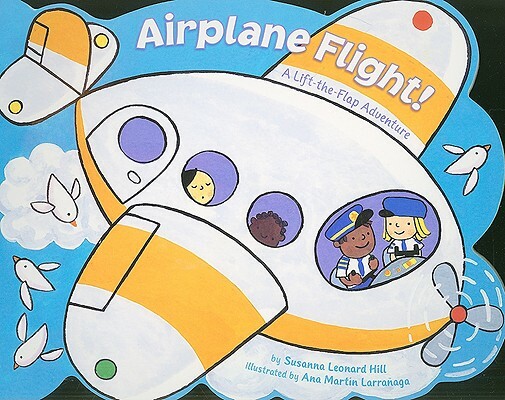 Susanna Leonard Hill's rhythmic text and Ana Martin Larranaga's simple but enticing art will take young readers on an exciting airplane ride! Kids can lift the10 flaps throughout the book to make their flying and reading experience more fun! Fasten your seatbelt and fly above the sky with this interactive book that's shaped like an airplane. This format is perfect for young children who are going on a plane for the first to one-hundredth time! Susanna Leonard Hill is the award-winning author of nearly a dozen books for children, including Punxsutawney Phyllis (A Booklist Children’s Pick and Amelia Bloomer Project choice); No Sword Fighting in the House (a Junior Library Guild selection); Can’t Sleep Without Sheep (a Children’s Book of the Month); and Not Yet, Rose (a Gold Mom’s Choice Award winner). She lives in New York’s Mid-Hudson Valley with her husband, children, and two rescue dogs. She loves chocolate, animals, and being outdoors. Ana Martin Larrañaga lives with her family in Germany. She doesn't have a dog or a goat but is always thinking of getting one (maybe because her eldest son asks for one of each constantly). She is the illustrator of more than 60 children's books.